The stand-alone pump driven unit (PDU) is the backbone of the Firexpress product range. With its ability to deliver 30 litres of water per minute or 150 litres of aspirated foam per minute at a range of 15 metres for micro-drops and 18 metres for a jet of aspirated foam, it is the most powerful system in the Firexpress range of products. The pump driven unit is used by many fire brigades and other professional fire fighters and built into fire and rescue vehicles, often as an addition to high pressure/high volume pump systems and using an already installed water tank. It is also used as the primary fire fighting system in e.g. forward command cars, which will proceed the dispatch of normal fire engines, often rendering them unnecessary. It can also be used without an integrated water tank. The unit can placed permanently in a location and have water supplied directly from a fire hydrant or it can be mounted on e.g. a hand cart and have water supplied via suction from an external water source. The pump driven unit has a self-priming membrane pump that pressurizes the water up to a working pressure of up to 40 bar. The pump is driven by a petrol or diesel engine, a 220 or 380 volt electric motor or a hydraulic pump. The pump driven unit is designed to be connected to a water tank, that can be of any size and dimension, and is suitable for being built into a vehicle that already has a water tank such as a traditional fire engines or almost any other four-wheeled vehicle with a custom designed water tank. The pump driven unit has an integrated foam delivery system, that mixes the foam into the water just before the pump. The foam percentage can be adjusted by the user by inserting an orifice giving the desired foam percentage between 1 and 6%. Besides sucking water from an integrated water tank, the pump driven unit can also be used by sucking water from external water sources such as rivers, lakes, the sea, swimming pools or other water sources. The external suction system can be used to either simultaneously fighting the fire or to fill the water tank. The suction rate is 38 litres per minute. The system can have a secondary foam delivery system installed to either increase the quantity of fire fighting foam or for carrying a secondary foam type. Via a selector switch, it is possible to choose using foam from either foam container or no foam at all. 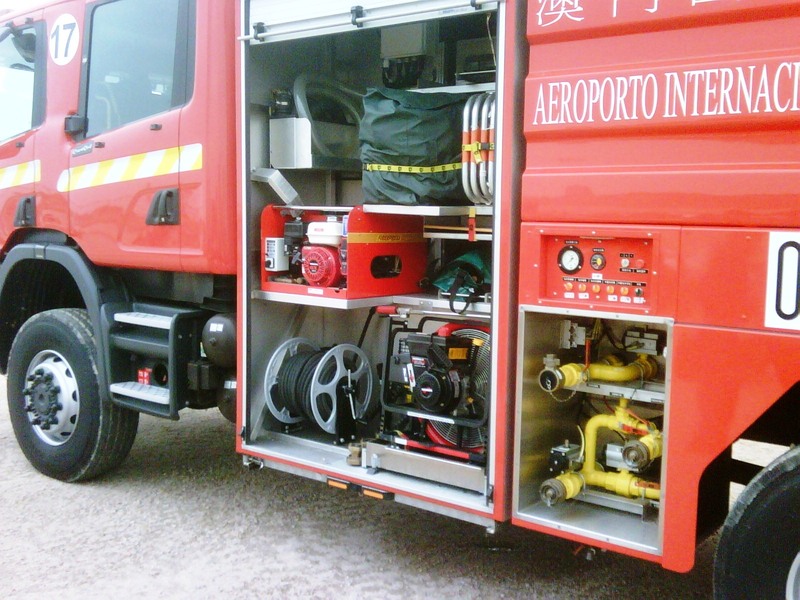 A fire engine at Macau International Airport with a petrol version of the pump driven unit and a hose reel with 50 metre of hose. 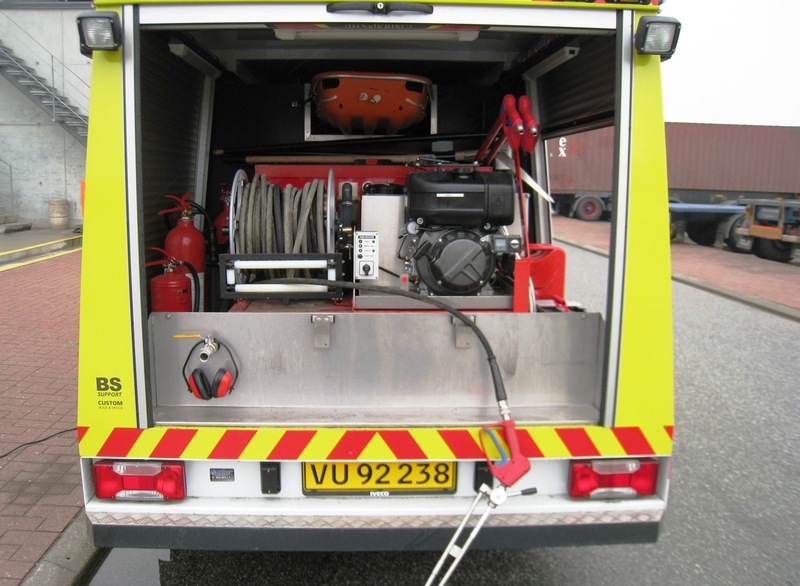 A light rescue vehicle at the Port of Aarhus, the largest container port in Denmark with a diesel version of the pump driven unit.